The Brodsky Papers comprise letters, newscuttings, programmes, telegrams, photograph albums, loose photographs, concert tickets, official documents (marriage certificate, diplomas) and music, which were found in the Brodsky home following the death of their last surviving heir. The whole of Brodsky's life as a performer, including his 34 years as Principal of the Royal Manchester College of Music, is represented along with his home life with his wife Anna. The earliest item in the collection is a letter of recommendation from Meyerbeer after hearing the young Adolph play a fantasy by Allard in Berlin in 1862. 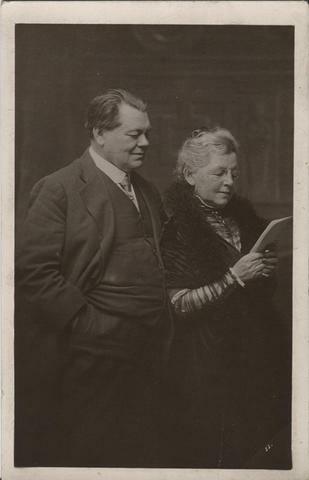 The longest correspondence is between Nina Grieg, who with Edvard met the Brodskys in Leipzig in the 1880s [Edvard had been a student at the Leipzig Conservatoire from 1858 until 1862] and Anna Brodsky. This dates from 1890 and continues with Anna's sister Olga even after the deaths of the Brodskys in 1929. It is conducted in German except for the duration of the Great War when Nina wrote in English. This covers social, political, philosophical, religious and musical matters as well as health. Of special interest is the visit of the Brodskys, with two pupils and Anna's niece, to the Griegs' home at Troldhaugen in 1906. There are about thirty letters from Edvard to Adolph and about a hundred from Nina to Anna. Also of great interest are the letters from Pyotr Il'yich Tchaikovsky who was overjoyed that his concerto had been played at last even if Hanslick, the Viennese critic, damned it as stinking. Tchaikovsky visited the Brodskys in Leipzig and was charmed by Anna Brodsky and her sister Olga. He also met Brahms and Edvard and Nina Grieg at the Brodskys' and the Griegs frequently recall this memorable evening in their letters to Adolph and Anna Brodsky. In one of his letters to Brodsky, Brahms gives practical advice to the players of his Quintet in G major op.111: the two violins must bluff their forte to allow the violoncello to come through. In 1891 he sends the Brodskys a photograph of himself and wishes them eine gute Fahrt " before they sail for New York. He had done his utmost to dissuade the Brodskys from going to America. In a letter sent to New York, Brahms asks Brodsky to mark fingerings and bowings for a Schirmer reprint. There are many letters from conductors: Hans von Bülow, who conducted in Meiningen where Brodsky was a frequent soloist; Hans Richter, who conducted the Vienna Philharmonic in the memorable first performance of the Tchaikovsky Violin Concerto and later conducted the Hallé from 1897 until his retirement in 1911 [the Richters lived round the corner from the Brodskys in Bowdon]; and Hamilton Harty, who conducted the Hallé from 1920 until 1933. There are also two letters from the Manchester critic Neville Cardus. In the collection there are letters from the lesser-known composers Busoni, Sinding and Halvorsen. Turgenev, the Russian author whom Brodsky met in Paris, wrote three letters. There are many letters from Edward Elgar - the Elgar Violin Concerto was a great favourite of Brodsky's which he played daily. There are also letters from Saint-Saëns, Dont, Ysayë, Carl Fuchs and Simon Speelman, cellist and violist respectively in the Manchester formation of the Brodsky Quartet. In addition to these letters from famous international stars of the day there are begging letters for the poor children of Vienna after the Great War and rather sad letters from Ottokar Novacek [second violin and later viola in the original Brodsky Quartet] begging for money so that he can have a year off in order to compose. At a more local level are a few letters from pupils asking to be excused from their lessons. The Papers create a vivid image of Brodsky as a musician who did broadcast on the wireless but of whom we have no known recordings, as a teacher, a chamber music player, a chess player, bon viveur, philanthropist, a kind husband and affectionate uncle, and one of the earliest motorists of Bowdon. AB 1080 and AB 1081 were originally catalogued as AB ???" Some arrangement by type (newspaper cuttings, letters), and by correspondent but not consistent throughout papers. Some items are listed as being created by Adolph Brodsky but were simply collected by him and it is unknown who created them. Items AB 897-937 are poor quality photocopies. AB 666 is a copy of an original which was given to John Ogdon in 1962. Items AB 296-305 are photocopies of originals. Items AB 897-916 are photocopies of originals (to the Griegs) held in Griegsamlingen, Bergen Offentlige Bibliotek, Norway. Included in Library GeoCat catalogue as MARC records. Index and calendar (on cards) of correspondents. Transcriptions of items AB 604-614, 621, 627, 899-916. Translations of items AB 490-492, 643, 645-648, 650-652, 663-665, 667-678, 681, 694, 696, 697, 899-916.